Called “utterly riveting and relentlessly creepy," author Julia Heaberlin's novel of suspense will thrill you. For better or worse, I am walking the crooked path to my childhood. The house sits topsy-­turvy on the crest of a hill, like a kid built it out of blocks and toilet paper rolls. The chimney tilts in a comical direction, and turrets shoot off each side like missiles about to take off. I used to sleep inside one of them on summer nights and pretend I was rocketing through space. More than my little brother liked, I had climbed out one of the windows onto the tiled roof and inched my scrappy knees toward the widow’s peak, grabbing sharp gargoyle ears and window ledges for balance. At the top, I leaned against the curlicued railing to survey the flat, endless Texas landscape and the stars of my kingdom. I played my piccolo to the night birds. The air rustled my thin white cotton nightgown like I was a strange dove alit on the top of a castle. It sounds like a fairy tale, and it was. My grandfather made his home in this crazy storybook house in the country, but he built it for my brother, Bobby, and me. It wasn’t a huge place, but I still have no idea how he could afford it. He presented each of us with a turret, a place where we could hide out from the world whenever we wanted to sneak away. It was his grand gesture, our personal Disney World, to make up for the fact that our mother had died. Granny tried to get rid of the place shortly after Granddaddy died, but the house didn’t sell till years later, when she was lying in the ground between him and their daughter. Nobody wanted it. It was weird, people said. Cursed. Their ugly words made it so. After I was found, the house had been pasted in all the papers, all over TV. The local newspapers dubbed it Grim’s Castle. I never knew if that was a typo. Texans spell things different. For instance, we don’t always add the ly. People whispered that my grandfather must have had something to do with my disappearance, with the murder of all the Black-­Eyed Susans, because of his freaky house. “Shades of Michael Jackson and his Neverland Ranch,” they muttered, even after the state sent a man to Death Row a little over a year later for the crimes. These were the same people who had driven up to the front door every Christmas so their kids could gawk at the lit-­up gingerbread house and grab a candy cane from the basket on the front porch. I press the bell. It no longer plays Ride of the Valkyries. I don’t know what to expect, so I am a little surprised when the older couple that open the door look perfectly suited to living here. The plump worn-­down hausfrau with the kerchief on her head, the sharp nose, and the dust rag in her hand reminds me of the old woman in the shoe. I stutter out my request. There’s an immediate glint of recognition by the woman, a slight softening of her mouth. She locates the small crescent-­moon scar under my eye. The woman’s eyes say poor little girl, even though it’s been eighteen years, and I now have a girl of my own. “I’m Bessie Wermuth,” she says. “And this is my husband, Herb. Come in, dear.” Herb is scowling and leaning on his cane. Suspicious, I can tell. I don’t blame him. I am a stranger, even though he knows exactly who I am. Everyone in a five-­hundred-­mile radius does. I am the Cartwright girl, dumped once upon a time with a strangled college student and a stack of human bones out past Highway 10, in an abandoned patch of field near the Jenkins property. I am the star of screaming tabloid headlines and campfire ghost stories. 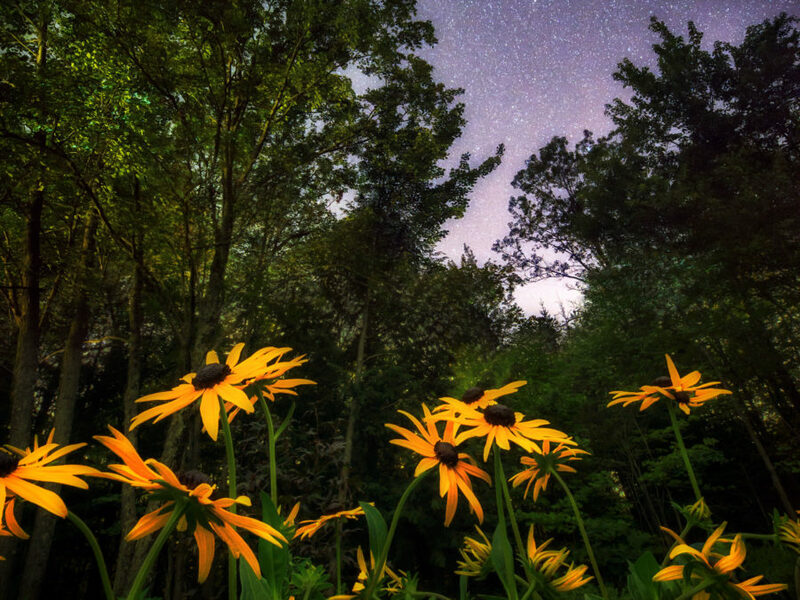 I am one of the four Black-­Eyed Susans. The lucky one. It will only take a few minutes, I promise. Mr. Wermuth frowns, but Mrs. Wermuth says, Yes, of course. It is clear that she makes the decisions about all of the important things, like the height of the grass and what to do with a redheaded, kissed-­by-­evil waif on their doorstep, asking to be let in. “We won’t be able to go down there with you,” the man grumbles as he opens the door wider. As she makes this grim pronouncement, I am frozen in the great room, flooded with memories, searching for things no longer there. The totem pole that Bobby and I sawed and carved one summer, completely unsupervised, with only one trip to the emergency room. Granddaddy’s painting of a tiny mouse riding a handkerchief sailboat in a wicked, boiling ocean. Now a Thomas Kinkade hangs in its place. The room is home to two flowered couches and a dizzying display of knickknacks, crowded on shelves and tucked in shadow boxes. German beer steins and candlesticks, a Little Women doll set, crystal butterflies and frogs, at least fifty delicately etched English teacups, a porcelain clown with a single black tear rolling down. All of them, I suspect, wondering how in the hell they ended up in the same neighborhood. The ticking is soothing. Ten antique clocks line one wall, two with twitching cat tails keeping perfect time with each other. I can understand why Mrs. Wermuth chose our house. In her way, she is one of us. “Here we go,” she says. I follow her obediently, navigating a passageway that snakes off the living room. I used to be able to take its turns in the pitch dark on my roller skates. She is flipping light switches as we go, and I suddenly feel like I am walking to the chamber of my death. “TV says the execution is in a couple of months.” I jump. This is exactly where my mind is traveling. The scratchy male voice behind me is Mr. Wermuth’s, full of cigarette smoke. I am wrong about Herb. It wouldn’t be the first time I’ve been wrong, or the last. “Crazy damn house,” Herb says under his breath. “What in the hell is wrong with living in St. Pete?” He doesn’t seem to expect an answer. The spot on my cheek begins to complain and my scar echoes, a tiny ping, ping, ping. The hallway has settled into a straight line. At the end, an ordinary door. Mrs. Wermuth pulls out a skeleton key from her apron pocket and twists it in the lock easily. There used to be twenty-­five of those keys, all exactly the same, which could open any door in the place. An odd bit of practicality from my grandfather. A chilly draft rushes at us. I smell things both dying and growing. I have my first moment of real doubt since I left home an hour ago. Mrs. Wermuth reaches up and yanks on a piece of kite string dancing above her head. The bare, dusty lightbulb flickers on. “Watch the sixteenth step,” Mrs. Wermuth warns. “Some critter chewed a hole in it. I always count when I go down. You take as long as you like. I think I’ll make all of us a cup of tea and you can tell a bit of the history of the house after. We’d both find that fascinating. Right, Herb?” Herb grunts. He’s thinking of driving a little white ball two hundred yards into Florida’s deep blue sea. I hesitate on the second step, and turn my head, unsure. If anyone shuts this door, I won’t be found for a hundred years. I’ve never had any doubt that death is still eager to catch up with a certain sixteen-­year-­old girl. If this is an opening, I don’t take it. I descend noisily, like a kid, jumping over step sixteen. At the bottom, I pull another dangling string, instantly washing the room with a harsh fluorescent glow. It lights an empty tomb. This used to be a place where things were born, where easels stood with half-­finished paintings, and strange, frightening tools hung on pegboards, where a curtained darkroom off to the side waited to bring photos to life, and dress mannequins held parties in the corners. Bobby and I would swear we had seen them move more than once. A stack of old chests held ridiculous antique dress-­up hats wrapped in tissue paper and my grandmother’s wedding dress with exactly 3,002 seed pearls and my grandfather’s World War II uniform with the brown spot on the sleeve that Bobby and I were sure was blood. My grandfather was a welder, a farmer, a historian, an artist, an Eagle Scout leader, a morgue photographer, a rifleman, a woodworker, a Republican, a yellow dog Democrat. A poet. He could never make up his mind, which is exactly what people say about me. He ordered us never to come down here alone, and he never knew we did. But the temptation was too great. We were especially fascinated with a forbidden, dusty black album that held Granddaddy’s crime scene photographs from his brief career with the county morgue. A wide–­eyed housewife with her brains splattered across her linoleum kitchen floor. A drowned, naked judge pulled to shore by his dog. I stare at the mold greedily traveling up the brick walls on every side. The black lichen flourishing in a large crack zigzagging across the filthy concrete floor. No one has loved this place since Granddaddy died. I quickly cross over to the far corner, sliding between the wall and the coal furnace that years ago had been abandoned as a bad idea. Something travels lightly across my ankle. A scorpion, a roach. I don’t flinch. Worse things have crawled across my face. Behind the furnace, it is harder to see. I sweep the light down the wall until I find the grimy brick with the red heart, painted there to fool my brother. He had spied on me one day when I was exploring my options. I run my finger lightly around the edges of the heart three times. Then I count ten bricks up from the red heart, and five bricks over. Too high for little Bobby to reach. I jam the screwdriver from my pocket into the crumbling mortar, and begin to pry. The first brick topples out, and clatters onto the floor. I work at three other bricks, tugging them out one at a time. I flash the light into the hole. Stringy cobwebs, like spin art. At the back, a gray, square lump. Waiting, for seventeen years, in the crypt I made for it. JULIA HEABERLIN is the author of Black-Eyed Susans, Lie Still, and Playing Dead. She is an award-winning journalist who has worked at the Fort-Worth Star Telegram, The Detroit News, and The Dallas Morning News. 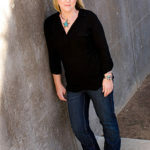 She grew up in Texas and lives with her family near Dallas/Fort Worth, where she is at work on her next novel of psychological suspense.